A lot of teachers are using Twitter in a lot of different ways. This is a good way for Twitter virgins to start using twitter with their class. In my opinion the EASIEST way (especially for technophobes) is to use it as an alternative to a class website. You can use it to tweet homework assignments to keep students up to date. Since I teach two different subjects I have two different hashtags. 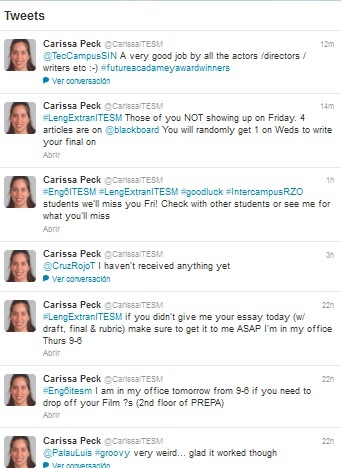 That means if I am making a tweet about an assignment for my high school students I include #Eng6ITESM. If the students have twitter they can easily keep track of the information I share. If they don't have twitter, it is still pretty easy for them to go to my twitter feed (https://twitter.com/CarissaITESM) or their class hashtag (e.g. #LengExtranITESM or #Eng6ITESM) for all the relevant tweets. It also tends to be a much faster way to contact students and get immediate feedback than using their e-mail. What kind of things should you share? If you take one more step forward (using dropbox), you can place documents like the class rules, syllabus, due dates, assignment weights etc. as part of your profile (or when you tweet assignments include a direct link to it). I usually tweet homework and assignments reminders, test score averages, and any random relevant information that I care to share and they know that if it has their hashtag, it is about their class. I also like to put links to pictures of students work, or videos that they have done for my class. Sharing it with my other students makes them feel a bit of pride and then other students can learn from what they did. Once you get more comfortable you can link it to a facebook to allow students another way to follow the information.